From La Bohème to Rent, we love melodramatic stories about starving artists, poets, and composers. We never get enough of soulful young men and the girls who adore them struggling to live la vie Bohème. They grab our hearts. The clichés all arise from the second half of the 19th century, of course, and a century and a half later, the paintings they sold for a pittance (or failed to sell at all) now sell for millions of dollars. Where’s the justice in that? Artists will tell you there is no proper reward for what they do, especially while they’re alive. It seems that you have to be dead for at least a century to be famous. 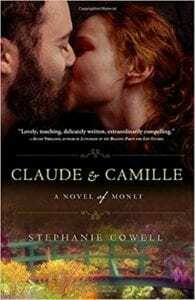 Stephanie Cowell’s new novel, Claude & Camille, is based on the life of Claude Monet, whose 1872 painting Impression: soleil levant (Impression: Sunrise) gave a name (at first critical, only later laudatory) to the school of art he and his buddies—Bazille, Renoir, Pissarro, Manet, Cézanne, et al.—created in the 1860s and ’70s. Monet (1840–1926) came from a proper bourgeois family that expected him to take over his father’s shop. Instead, he started drawing caricatures in chalk, then was invited by an older artist, Eugène Boudin, to meet him at dawn to paint outdoors. It’s the outdoors part that is revolutionary; until that time, nearly all painting was done in a studio or the patron’s residence. Plein-air landscape painting was nearly unknown, and because the young men broke the rules of academic painting, their works were almost never accepted by the Salon in Paris. But the soon-to-be impressionists soldiered on, devoting their lives to their art and going into debt to buy paint and canvas. Cowell opens each chapter with an epigraph taken from the actual words of the artists. “We were all one group when we started out,” said Renoir. “We stood shoulder to shoulder and we encouraged each other” (p. 60). Impressionist art, of course, soon inspired impressionist music (Debussy, Ravel, Vaughan Williams, et al.) and impressionist literature (Baudelaire, Rimbaud, Woolf, et al.). He gave her a last bitter look and without taking his coat, stormed out into the night. He walked for hours. Normally he felt such a part of this city, but now he felt all alone. How bitterly he regretted the words he had spoken! Well, it was her fault (pp. 183-84). Hungry artists are forever seeking commissions that will pay them enough to live. Monet has a stroke of luck when he’s hired by a businessman named Ernest Hoschedé. The deal is that he will spend weekdays painting at the Hoschedé estate and go home to Camille on weekends. While he’s painting, however, he falls in love with Alice Hoschedé, and when her husband’s business fails, Claude invites Alice and her six children to live with him, Camille, and their two children. It’s a very large ménage á trois, but it was children of both of Claude’s wives who preserved his paintings and the estate at Giverny. Readers who want to see Claude’s beautiful paintings of Camille and his early landscapes, most of which are mentioned in the novel, can go to Wikipedia, where they are reproduced.